Eric Cassée got his start in photography shooting for the local papers on Maryland’s eastern shore. After a stint studying landscape photography in Italy, he decided to stick with shooting people and interned at Daylight Studios in Paris. While at Daylight, he assisted both fashion and commercial photographers from all over the globe. A loyal fan of red wine and all things Italian, Eric also plays guitar and piano, and has aspirations to write. Altpick Connects had the pleasure of talking with Eric about his recent photo assignment with TIME magazine. AP: Eric, recently you photographed a series for TIME magazine of school kids. What was the article about? EC: The article was about a new educational software tool being used in some schools around the country. The software products are from Knewton, a New York based tech start up. While using the programs to complete lessons, tests, quizzes or comprehension assignments, the various programs track how a student learns best by collecting data as the student works. Such as: the time of day, the subject matter, how long it takes them to answer questions, how correct the answers given are, and more information I am not privy to. Over time it builds a profile of the student that can show their own individual strengths and weaknesses and tailor lesson plans specifically for them, as well as predict how they will perform in the future in high school, the SAT’s, even college. AP: Are these kids models? EC: No, none of the kids are models. Though by the end of the shoot a few of them were sure acting like it. They were all students that are currently participating in the Knewton program. AP: What was the mood, expression or style were you trying to achieve in this particular shoot? EC: Well, originally when I spoke with the art director for the story, he referenced a shot of mine that he saw on my website of a man sleeping on an airplane. His face was lit by the small TV screen in the seat back. He really liked the light and the moodiness of the image and wanted to go in that direction with the images for this story. 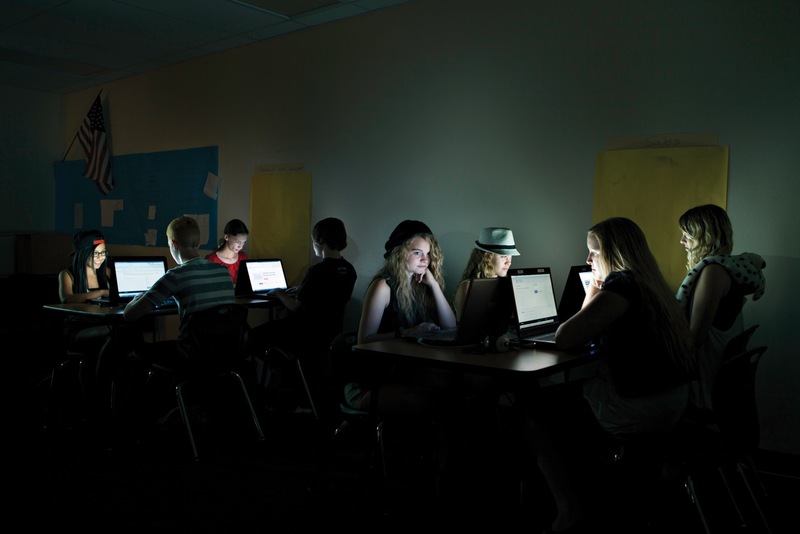 We talked about how to incorporate something as aesthetically unappealing as someone sitting at a school desk computer into an interesting image that told a story of interaction between the student and machine. I was really glad that he didn’t want something straightforward and that I had some creative freedom to do something interesting with light. That resulted in the dark images of the kids at the screens. 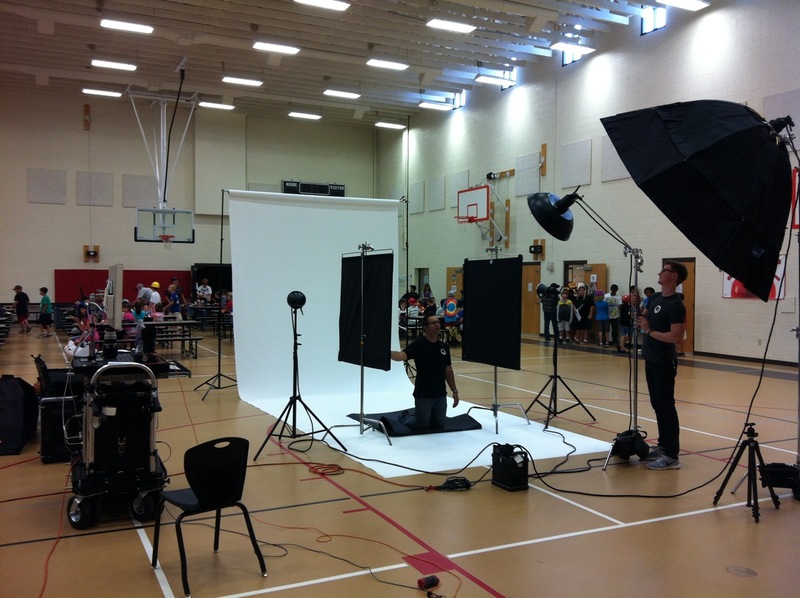 We essentially built a small black cave in the gymnasium of the kids’ school with large flags, C-Stands, and black seamless. The shutter speeds were slow in order to pull the glow off the laptop screen, so the kids had to be pretty still. That was the first challenge: getting an expression that did not appear posed or static and then getting the kids to hold it. Middle school school kids are crazy, there’s just so much going on in their heads. If as a director you can get some of those insecurities, random thoughts, humor, or obnoxiousness out of them, it makes a great image. It was really fun interacting with them and coaxing them out of their high school shells. So much fun that we decided to try another treatment while we were there. We went with a standard blown out white background portrait set up and just got the kids in front of the camera. They were all stoked to be out of class and were just hanging out and teasing each other. I was listening to them and remembering how much I hated high school, but the more I listened and watched them the more I started to see who they were and I got an idea of who was going to do what in front of the camera. I saw what their personalities were like, they were all so different, and my goal was to capture that. Originally these second shots were considered for individual head shots with quotes for the layout. I really liked looking at the diversity of characters on my screen while working in post, and I had an idea for a composite that I thought would look cool. I did a quick mock up and ran it by the art director. He loved it, and it ended up a double page spread. AP: Tell us a little about the behind-the-scenes. Did you run into any snags? EC: The first snag was that I almost ran out of gas in the middle of the freakin’ desert. This school was OUT THERE. I was doing exactly what my iPhone told me to do up until it didn’t know where the hell it was anymore. So I called my digital tech who was ahead of me. He explained that I was gong to keep going through this “town area”, over a ridge, and then to just keep going until it looked like I was going to disappear forever into the desert never to be found again. Quite literally, there was NOTHING to see in any direction for far to long for me to be comfortable. My dashboard was telling me I had 0 miles left before empty. Did I mention it was approximately 150 degrees? As luck would have it, the first man made structure I encountered upon returning to civilization was a Shell station, so catastrophe was averted. Once at the school we scouted around a bit, testing the ambient light, looking for some cool settings. We eventually made base camp in the gym, which also served as the cafeteria, and was in full blown lunchtime chaos when we starting loading in gear. That was funny. The kids were geekin out, the boys showing off for the girls a foot taller than them, all the awkwardness of puberty on full display. Some kid came right up and dunked a basketball at the short hoop right next to two 30″ monitors on the Digi-Tech’s cart. We exchanged glances. He was promptly scolded by the cafeteria boss who was exactly like every male gym teacher you have ever seen in any movie ever. I felt like I was in a John Hughes film. But of course, once we were set up, myself, my assistant, and the tech all had to have a go at dunking on the short hoop. AP: What was it about the assignment that you loved the best? I find that photo assignments are the same for me. I don’t always get to do exactly what I would like to do, but there is always something beautiful in any assignment that I try to identify and concentrate on. Personally I love working with people as my subject. I always try and try to pull something out of them until I get it. With this assignment, that was pretty easy. The kids are all showing you something because they are still kids. They haven’t had years of practice crafting their ego’s to reflect only who or what they think they should be. So they may be wild and crazy, or quiet and detached, but whatever it is, it’s them, and it’s beautiful. To see more of Eric Cassée’s work go to his website and Altpick page. This entry was posted in Altpick, Photography and tagged computer, data, education, Eric Cassee, kids, knewton, SAT, softward, students, tests, TIME magazine. Bookmark the permalink.